Hibs midfielder Merouane Zemmama will miss the rest of the season after suffering a knee injury during the 3-1 win over Falkirk at the weekend. The Moroccan international has damaged cruciate ligaments and the club are assessing the extent of the problem. The 26-year-old playmaker has been dogged by a recurring nerve problem this season and Saturday marked his first start since 17 February. Zemmama missed last term at Easter Road on a season-long loan move to Al Sha'ab in the United Arab Emirates, since Home Office regulations prohibited a permit being issued to his wife, who was under 18 years of age at the time. Can Hibs clinch third place without Zemmama? He returned to Edinburgh for the beginning of this campaign and has scored three goals for John Hughes's side. 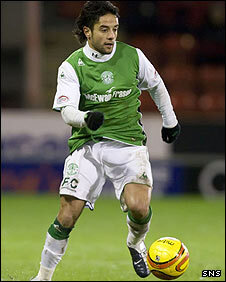 A key influence for Hibs when on form, his absence for the vital run-in will be sorely felt.